Teeth, teeth, teeth! I can’t remember how many times I lost a fish because of its teeth. And believe me, it feels awful when you lose a fish from biting and breaking the leader. But teeth are the weapons of some species. The tools to tear, grab and dismember their prey. 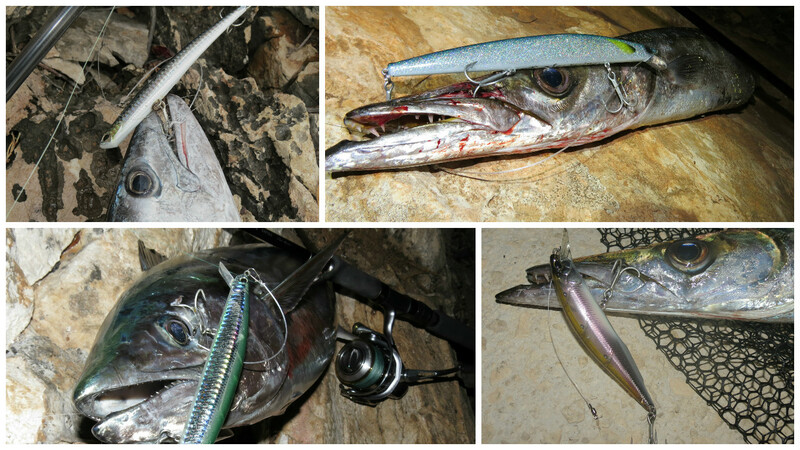 The most common fish here in the Mediterranean region that have teeth capable of breaking the line are four. 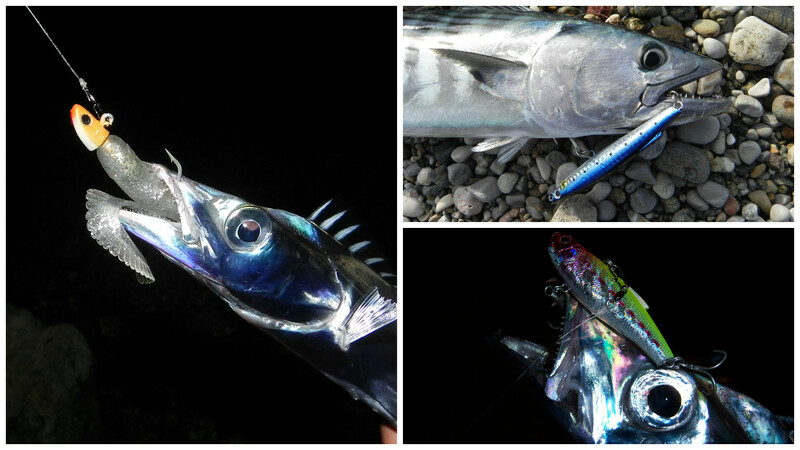 The barracuda, the bluefish, the bonito and the silver scabbard fish. 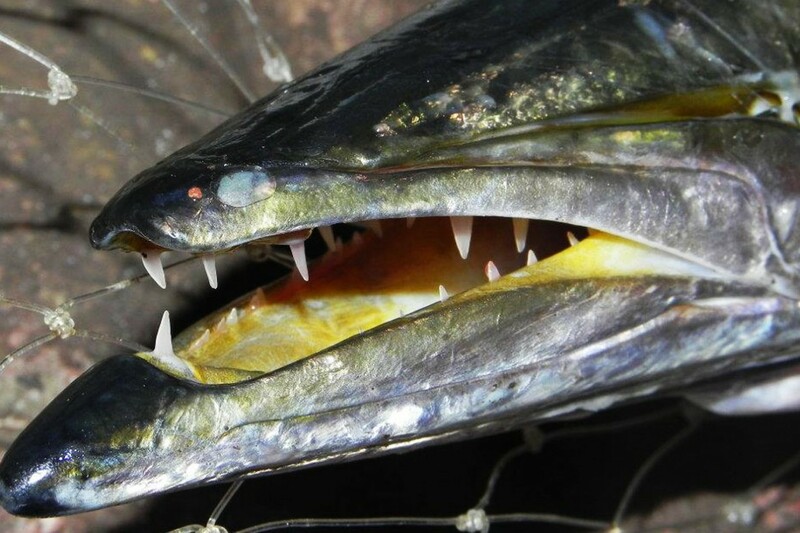 Those fish sometimes attack on the head of our lure and no matter how long our lure is, if a tooth wounds our leader, the result is going to be the same. The breaking occurs either instantly, either after some seconds, since it got damaged and breaks on the first strong tense. Some people use steel wire for protection, but wire is too much for me to use. I prefer to do the trick that you are going to see right here. I use a thicker short second leader attached to the main leader. This short leader plays the role of the “crash dummy” and is only 10 to 15cm long. Its role is to get the hit, since most teeth scratches occur on those 15 centimeters. 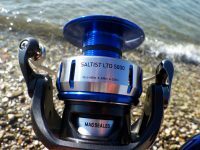 This short leader is made from thicker fluorocarbon leader than the main leader. For example if our main leader is 0.30mm the protector leader can be from 0.45mm to as high as 0.80mm, depending our situation and needs. Things that control how thick our protector leader can be, are the type and size of the fish and how strong and fast our rod is. The more “aggressive” our rod is the thicker leader we need, because the tense our rod creates on the teeth of the fish is higher. A “softer” rod creates less tense. Then a large role play also the type of the fish. Bonitos are the less dangerous and only when they turn and accidentally take the leader in the mouth they will break it, because of the power they have during running, Protector leader can be 0.45mm to 0,50mm the most. Then comes the barracuda. Sharp double row teeth are easily capable to cut the leader. Barracudas need thicker protector leader like 0.55mm to 0.65mm. We all know about the jaws of the bluefish. And all of us who are fond to fish them, we all had losses because of their razor sharp teeth that are combined with the extraordinary power of their jaws; compose one of the deadliest mouths in the sea world. 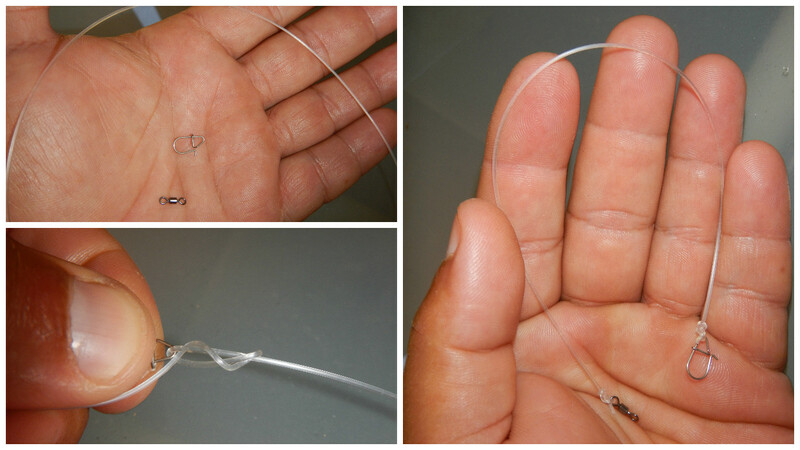 Bluefish need the least a 0.60mm protector leader that can be raised as high as 0.80mm. Last but not least is the Scabbard fish or frostfish. Those deep demons come ashore to feed on cold winter nights. Their fangs like teeth are from the sharpest in the sea kingdom. 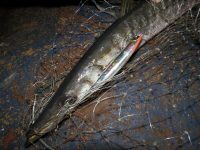 Except this, scabbard fish are known to attack almost exclusively on the head and this made many people cry for their lost expensive lures. Like bluefish, a 0.60mm protector leader that can be raised as high as 0.80mm is essential. Advantages: Protector Leader is more discreet than steel wire and easily replaceable. Even if it gets bended, we simply stretch it and become like new, unlike steel wire. Also it is easy to replace. Disadvantages: There is the negative side of the story. Protector leader affect the natural movement of the lure. No matter soft lure or hard like minnow, vibrating lure etc, the thicker the protector leader is, the more it affects it. So if there is not actual need, avoid using it. 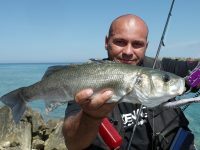 Protector leader is the last option we have in order to use in aggressive fish with sharp teeth and sometimes it discourages other types of fish like sea bass to strike on our lures. So use it responsibly.